In 2012 Toyota dominated the German hybrid car market with the Yaris the most popular hybrid passenger vehicle in Germany. Top five from Toyota. The German hybrid car market in 2012 grew by 70% to over 21,000 new hybrid passenger vehicle registrations. Toyota dominated the German hybrid car market with a three-quarters market share. The top five best-selling models were from Toyota, with the Yaris now more popular than the Auris and Prius. Toyota’s luxury brand Lexus CT was the fourth most popular hybrid car and the new Prius Plus came in at fifth. German manufacturers have introduced hybrid cars but thus far with limited success. In 2012, a total of 21,438 new hybrid vehicle registrations saw the market expand by 70% from the 12,622 hybrid cars registered in 2011. These sales figures include 408 plug-in hybrids. Surprisingly, private buyers accounted for 46% of the hybrid car market in Germany in 2012. In contrast, private buyers make up 38% of the total new passenger vehicle market but only 11% of the electric car market. Businesses are slow to enter the hybrid car market – 7,732 hybrid cars were registered by the automobile industry itself as demonstration and research vehicles leaving only 3,899 vehicles for all other non-private use. In 2012, Toyota totally dominated the German market for hybrid cars. The top five best-selling hybrid cars in Germany were Toyota with Toyota (including Lexus) accounting for nearly three-quarters of all hybrid cars sold in Germany in 2012. 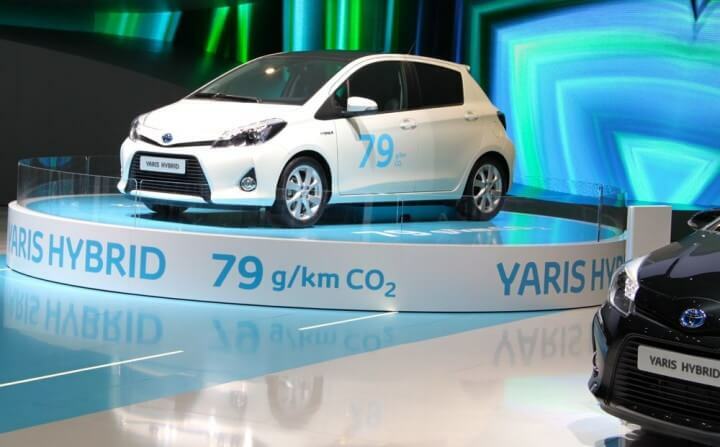 The new Toyota Yaris became Germany’s favorite hybrid car model. The hybrid Yaris was new to the German car market in 2012. It easily outsold the Toyota Auris, which was the most popular hybrid in Germany in 2011. Auris sales slipped due to the arrival of the cheaper Yaris but Prius sales further increased with the new larger Prius Plus entering the market at fifth place. The fourth placed Lexus CT and Lexus RX easily outsold any other luxury hybrid models. German manufacturers have finally started to offer hybrid cars to the German public but sales remain very low. The best-selling German branded hybrids were the Opel Ampera at sixth place and the Mercedes E-Class at eighth. Honda, which has three cars in the top-ten list in 2011, saw sales of its hybrid cars slipping in a growing market. The 2012 German electric car market saw growth of 37% but sales remained rather insignificant at only 2,956 cars.